RHP Daniel Poncedeleon (6'4", 225) became the Tampa Bay Devil Rays 38th round pick. The Sophomore from La Mirada High School accumulated an ERA of 3.05. Sophomore Canadian-born Rowan Wick was drafted in the 9th round by the St Louis Cardinals. Wick (6'4"/225lbs) played outfield and catcher . 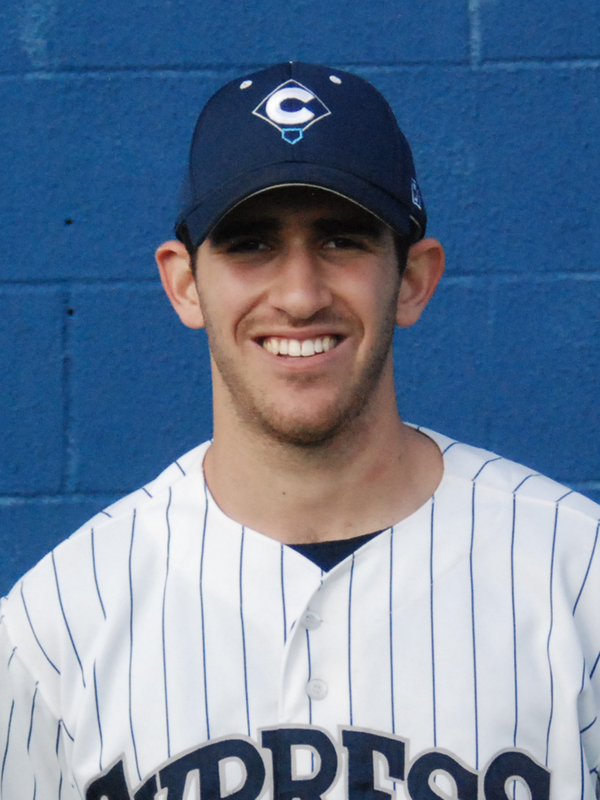 He also made 5 appearances on the mound and a 2.45 ERA for the Chargers in 2012. The Chargers baseball season has come to a close just short of a trip to the CA final-four tournament. Following a 3-0 loss to Orange Coast College on Friday, the Chargers were eliminated with a 5-4 loss to Glendale today. Congratulations to the players, coaches and athletics staff on another successful season. Cypress meets Orange Coast College at 11 a.m. Friday May 11 at Orange Coast College. If Cypress wins they will play Saturday at 11 a.m against the winner of game two. If Cypress loses, they will play the loser of game two at 10 a.m. Saturday at Golden West College in Huntington Beach. The Chargers traveled to San Luis Obispo this past weekend for the first round of Regional action. Cypress swept Cuesta two games to none allowing the Chargers to advance to the Four-Team Super Regional this coming weekend at Orange Coast College in Costa Mesa. Cypress will face off against the top seeded Pirates in the opening round at 11am on Friday. If the Chargers win, they will play Saturday at 11am against the winner of game two. If Cypress loses, they will play the loser of game two on Saturday at 10am at Golden West College in Huntington Beach. The Super Regional Tournament is a Four-Team double elimination tournament in which the winner advances to the State Tournament. Mt. Sac, Glendale, Orange Coast, and Cypress have all made it this far, and none of the teams show any signs of slowing down. 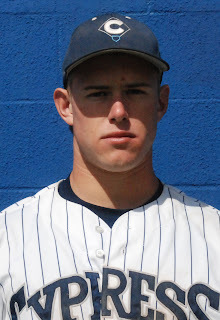 Sophomore catcher Brad Hartong was named to the 2012 All-Orange Empire Conference Baseball Team. Four of his teammates earned ?Second Team? selections: pithers Daniel Poncedeleon and Darren Gidley; utility player John Torres; and infielder Robert Chauarria. Chargers put on their best hitting performance of the season today against the visiting Golden West Rustlers. Cypress, Calif. - If there was such a thing as a picture perfect swing, Rowan Wick of Cypress College had it today. He went 4 for 4 with a two run opposite field bomb in the sixth inning to help the Chargers cruise into there fifth Orange Empire Conference victory. Cypress (11-19, 5-11) defeated Golden West (18-15-1, 9-10) 10 to 5 keeping there slim chance at the playoffs alive. Cypress starting pitcher, Stephen Derr, was nearly flawless today as he had his best start of the season. 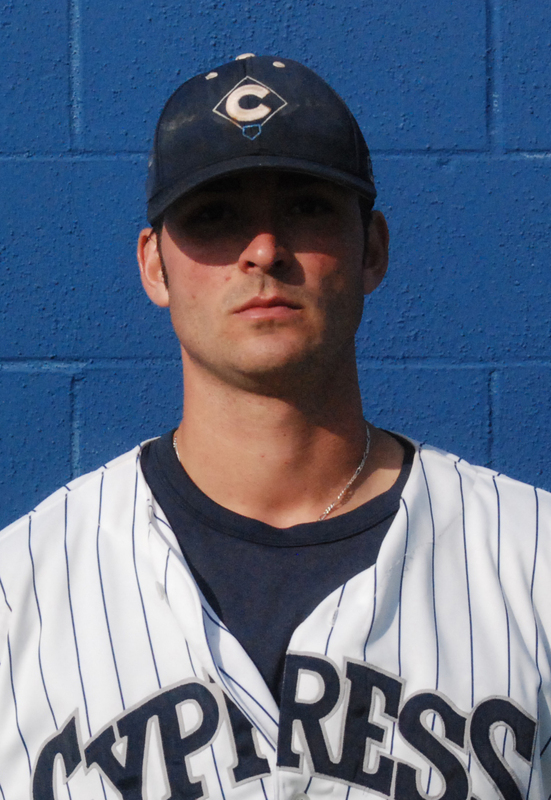 Derr went seven and two-thirds innings for the Chargers while only allowing two unearned runs. Alon Leichman came in in relief, while Kevin Klaess, and Josh Anderson got their fair share on the mound as well. Rowan Wick may have led the offensive charge, but Dylan Fitzgerald, Parker Starr, and Dylan Moore were not too far behind. As a team, the Chargers reached base safely on seventeen hits. Fitzgerald and Starr came together with a combined three RBI's while Moore added two hits to the surge. The Chargers will finish up the series against the Rustlers tomorrow at Golden West. Cypress is in a must win scenario for the playoffs to even come down to a coin flip. For the second game in a row, Cypress only managed to score two runs against the Gauchos. Cypress, Calif. - The Chargers (19-11, 6-9) really could have used a victory over Saddleback College (11-17, 5-10) at home on Thursday, but things didn't go Cypress' way in a 10-2 Orange Empire Conference loss to the Gauchos. Robert Chavarria blasted a solo shot over the left field wall in the top of the sixth to give Cypress one of its runs, while Dylan Fitzgerald scored from third on a wild pitch after tripling to the wall in centerfield. Pierce Bily, Chavaria and Brad Hartong all had two-hit afternoons. Saddleback's Lee Casas drove in three runs on 3 of 4 hitting and a runs scored. Gaucho leadoff man Ryan Forkel made the most of his one hit in five at bats by scoring twice, and driving in three runs as well. 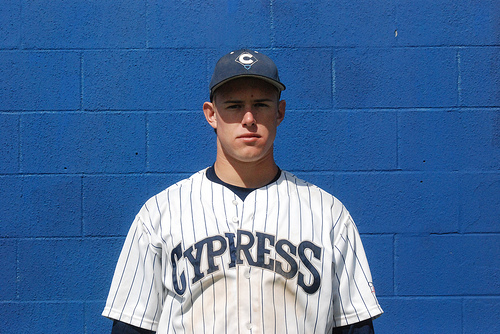 Cypress starter Stephn Derr left the game in the sixth after allowing four runs on four hits, with three strikeouts. Alon Leichman, Bryson Kauhaahaa, Kyle Ferramola and Releigh Rushing all came out of the pen for the Chargers. Cypress will hit the road Saturday afternoon, to take on Santa College in the second meeting of the two squads this season. On Tuesday at 2 p.m., Cypress will host the Dons in the final regular season matchup between the two teams. Six run inning Cypress is too much to overcome in a 7-2 loss at Saddleback. Mission Viejo, Calif. - Cypress College held a one-run lead through 6.5 innings, but a six-run seventh by Saddleback College (10-18, 4-10) secured the Orange Empire Conference victory for the Gauchos at home on Tuesday. Pierce Bily turned in a solid performance for the Chargers (19-10, 6-8) with a 3 for 4 day at the plate with one RBI and a run scored. Brad Hartong was 2 for 4, while Dylan Fitzgerald, Jake Clark, Parker Starr and Alex Newman each chipped in with a hit apiece. Newman scored the Chargers other run on the afternoon. Cypress starting pitcher Daniel Poncedeleon cruised through six innings by only giving up one run to the Gauchos, but a rocky seventh chased him from the game with one out in the inning. Ricky Schafer allowed the other three runs in the bottom of the seventh. The Chargers got on the board first in the top of third when Newman hit a single, moved to second on a ground out, advanced to third on a balk, and scored on a Saddleback error to make it a 1-0 ballgame. In the bottom of the inning Saddleback tied the game at 1-1, but Cypress went back ahead in the top of the fifth inning on a solo homer by Biley that made the score 2-1. The score stayed that way until the bottom of the seventh when Saddleback broke the game open with a six-run at-bat, and take a 7-2 lead. Cypress wasn't able to score again in its final two at bats. The Chargers return home to play the Gauchos in a tiebreaking third and final time this season. The Chargers won three straight in Fresno with wins over Cuesta, Canyons and host Fresno City. Fresno, Calif. - The spring break road trip came just in time for Cypress College baseball. After not hitting like they did for most of the year over the past few games, the Chargers got back to winning with a 2-0 victory over Cuesta in their first game of the week, a 13-2 pounding of College of the Canyons in their second matchup, and a tight 4-3 decision over host Fresno City College in their final game of the road trip. Daniel Poncedeleon was untouchable in five-hit, seven-inning scoreless outing that earned him an impressive victory over one of the state's top teams, Cuesta College. Darren Gidley got his seventh save of the season in two innings of work. Rowan Wick's solo homer, and a run batted in by Starr accounted for the only two runs of the game. Cypress put it on Canyons with a 13-2 rout, before closing out the week with a hard-fought one-run victory over Fresno. Despite getting outhit 14-5 by Fresno City, Cypress made the most of its opportunities by scoring four runs on five hits in a 4-3 non-conference victory. Brad Hartong was responsible for two of those hits, as well as two runs scored. Alex Newmann had the only RBI for Cypress in the game, while Dylan Moore and Jake MacWilliams each scored once in the game. Ricky Schafer scored his fourth win of the year with a solid performance out of the bullpen, and Darren Gidley shut Fresno down in the ninth to notch his eighth of the year. Cypress returns home on Thursday, April 12 to get back into Orange Empire Conference play when they host Saddleback College at 2 p.m.
Five Chargers finish with two hits apiece in win over Irvine Valley. Irvine, Calif. - Cypress College scored 10 runs on 12 hits to avoid the season series sweep by Irvine Valley. Charger starting pitcher, Stepen Derr (2-0) had the Lasers guessing all day by giving up just three hits and one run in six innings of work. Darren Gidley earned his sixth save of the year in a two-run, three inning effort out of the pen. Robert Chavarria, Jonathan Torres, Brad Hartong, Zach Alofaituli, and Parker Starr each finished with a pair of hits against Irvine Valley. Starr and Hartong both drove in two runs, while Chavarria and Torress had Cypress' other two RBI. Anthony Razo, Brad Hartong, Chavarria and Alofaituli each scored two times in the game. Mike Marcoux and Dylan Moore were the other two Chargers to cross the plate against IVC. Cypress broke a scoreless tie in the top of the fifth when Moore and Razo scored on a single to right by Chavarria to make it a 2-0 game. Torres drove in Chavarria to stretch Cypress' lead to three runs. The Chargers would add a run in the sixth when Alofaituli scored, and another in the eighth after Hartong came in to score and make it a 5-1 game. In the top of the ninth inning, Cypress busted the game wide open with a five-run rally that put the game out of reach for IVC. Razo scored the first run of the inning on a wild pitch, then Hartong doubled in Marcoux and Chavarria to give Cypress an 8-1 lead over the Lasers. Hartong would come around to score the fourth run of the inning, and Alofaituli scored the Chargers final run of the day on an RBI double by Starr that made it a 10-1 game at the time. Irvine Valley added a couple meaningless runs in the bottom of the ninth to make it a 10-3 final. Cypress hits the road for Spring Break when they head north to play at Fresno. The Chargers will return home on Thursday, April 12 when they Saddleback College in an Orange Empire Conference matchup. Early hole costs Chargers in loss to Lasers. Cypress, Calif. - Cypress College dropped its season series with Irvine Valley College at home on Thursday with a 7-5 loss in Orange Empire Conference play. Six Chargers (15-9, 5-7) finished with two hits against the Lasers (10-15, 4-8), but it wasn't enough to overcome an early deficit. Anthony Razo, Robert Chavarria, Jonathan Torres, Rowan Wick, Jake Clark and Parker Starr paced a Charger offense that posted 14 hits on the day. Cypress finished with five more hits on the day than IVC, but the Lasers jumped out to a 4-0 lead after one and a half innings and held onto that lead until the bottom of the sixth inning when Wick doubled in Torres and Chavarria to make it a 4-2 game. Irvine Valley would answer back with three runs in the top of the seventh to stretch its lead to 7-2, but the Chargers Cypress countered with three runs of their own in the bottom of the inning to return it to a two-run game. Razo drove in Starr for the Chargers first run of the inning, then Chavarria hit a bases-clearing double down the line in left to send Razo and Pierce Bily in to score, and cutting the Lasers lead to 7-5. That was the closest the game would get as Irvine Valley held on for the 7-5 OEC victory on the road. Rown Wick goes yard in Cypress' first loss of season to Riverside Community College. Cypress, Calif. - After taking the first two meeting of the year against Riverside College, Cypress College lost the third and final regular season Orange Empire Conference matchup 5-2 at home on Tuesday afternoon. Cypress starting pitcher Daniel Poncedeleon (2-2) picked up the loss after allowing three runs (all unearned) on four hits in six innings on the hill. Poncedeleon struck out a game-high seven Tigers and walked four. The Chargers Tiger counterpart, Blake Burrell (4-0) nearly went the distance, but couldn't retire the Chargers in the ninth inning. Burrell would eventually got the victory after allowing two runs (both earned) in 8.1 innings. He struck out five, allowed six hits and walked six. Joe Molina came in to close out the ninth inning for Riverside and earn his second save of the season. Riverside scored three times in the top of the third to go up 3-0 in the game. In the bottom half of the inning, Cypress got one run back when Parker Starr singled and stole second base to get in scoring position. Starr would come around to score on a base hit by Robert Chavarria that made it a 3-1 contest after three innings in the books. The Tigers tacked on two more runs in the top of the seventh to stretch their lead to 5-1 over Cypress. Heading into the bottom of the ninth the score stayed that way until Rowan Wick blasted a pinch-hit homerun over the right field wall off of Riverside's Burrell to get the Chargers back to withing three runs at 5-2. Wick's homer got out of the stadium so quickly, it took the fans a couple of second to realize what just happened. That was it for the scoring as the Tigers were able to hold on for the 5-2 OEC victory over Cypress College. The Chargers will host Irvine Valley at 2 p.m. on Thursday in the second meeting of the season between the two squads. Josh Anderson picks up fourth win of year; Pierce Bily drives in two runs in Chargers 4-1 victory. Riverside, Calif. - Cypress College clinched the season series with Riverside College on Saturday with a 4-1 victory on the road. The Chargers (15-7, 5-5) improved to .500 on the year in Orange Empire Conference play with their second victory in as many games against Riverside Community College (11-12, 6-4) this year. Cypress starting pitcher Josh Anderson (4-0) remained undefeated after tossing six innings of shutout ball, while striking out five, and allowing just four hits and three walks. Six other Charger relievers combined to finish out the final three innings of the game. Cypress outfielder Pierce Bily paced the Charger attack on offense with two RBI against the Tigers. Dylan Moore and Brad Hartong each finished with two hits on the afternoon, while Parker Starr scored twice in the game. Jacob MacWilliam and Trent Zaks accounted for the other two Cypress runs in the game. Cypress jumped out to a 2-0 lead in the top of the second when Trent Zaks singled to lead off the inning, then proceeded to steal second and third, before tagging up and scoring on a sac fly by Bily. Starr walked to get on base, and scored the second run of the inning when he came in from third base on a wild pitch. The Chargers scored a run in each of the next two innings to take a commanding 4-0 advantage over Riverside. In the top of the third inning, MacWilliam made it a 3-0 game when he scored the second run of the game for Cypress on a wild pitch. In the Chargers next at bat in the top of the fourth inning, Bily hit another RBI sac fly to score Starr and put Cypress ahead 4-0. The score remained the same for the remainder of the game until RCC put one run on the board in the bottom of the ninth to avoid the shutout at home. The win clinched the season series for Cypress College. The Chargers return home to finish off their season series against Riverside at 2 p.m. on Tuesday, and to host Irvine Valley for the second time this year at 2 p.m. on Thursday. Chargers let early lead slip away for second straight game against Coast. Cypress, Calif. - Cypress scores two runs early, but Orange Coast rallies from behind for the second straight game to beat the Chargers 5-3 in an Orange Empire Conference matchup at OCC on Thursday. Anthony Razo got the Chargers (14-7, 4-5) first inning rally started with a one-out double to right off of Orange Coast (21-2-1, 8-1) starting pitcher Brandon Brennan. Robert Chavarria singled to move Razo over to third, then Jonathan Torres came through with a two-out single to left that brought in Razo for the first run of the game. After moving over to third on the Torres single, Chavarria stole home to put the Chargers up 2-0 after a half-an-inning of play. Cypress starting pitcher Stephen Derr held Coast scoreless for the first three innings until the Pirates made it a 2-1 contest with a run in the bottom of the fourth inning. OCC would take a 3-2 lead in the sixth after scoring a pair of runs off of Derr. The Chargers tied the game at 3-3 in the seventh inning after Jonathan Torres scored from third base on a wild pitch. Cypress was in good position to regain the lead with a man only 90 feet away and just one out in the inning, but a harmless pop up and ground out ended their hopes for another score. Orange Coast made the most of its opportunity in the bottom half of the eighth inning by putting two runs on the board to take a 5-3 lead into the ninth inning. The Pirates made that score stand up to earn the season sweep over the Chargers with a 5-3 win at home. Cypress plays at Riverside on Friday in the second meeting of the year between the two squads. Cypress led through six innings, but a Orange Coast scored in four straight innings to get the win. Cypress, Calif. - Cypress College fell for the second time this season to Orange Coast College in Orange Empire Conference action at Cypress on Tuesday. The Chargers (14-6, 4-4) threatened to score in the bottom of the first inning, when Jonathan Torres reached on an infield single, then stole second base to give Cypress a runner in scoring position with only one out. The Chargers weren't able to get the run home when the next two hitters went down in order. Cypress starting pitcher Daniel Poncedeleon cruised through the first two innings of the game by retiring the first six men he faced in order, but a leadoff double down the right field line in the top of the third by OCC's Bryan Garza put the Pirates in good position to grab the first lead of the game.The next batter was hit by a pitch, and the following batter reached on an infield single that trickled down the line. With the bases loaded and nobody out, things weren't looking good for the Chargers. That is until Poncedeleon got the OEC's leading hitter, Boog Powell, to pop up for the first out of the inning. Coast's Joel Licon had a chance to bust open a big lead for the Pirates, but his line drive back to the pitcher turned into an inning-ending double play for the Chargers' defense, when Poncedeleon snagged it out of the air for out number two, then raced over to the third base bag to double up Garza who was going on the play. Heading into the bottom half of the third inning, the game remained scoreless until Brad Hartong (2 for 3, 2 runs) led off with a single to left, then stole second base. Two batters later, Torres (2 for 4, 1 RBI) drove in Hartong with a single to right that gave Cypress a 1-0 advantage through three complete innings. Neither offense could get much of anything going against the opposing pitcher, but OCC found a way to tie the game up in the top of the sixth when Licon scored on a sac fly to right by Bijan Rademacher that tied the game at 1-1. The Pirates struck again in the seventh with another run to make it a 2-1 game after Poncedeleon got the first batter of the inning out, then put the next two men on base with the top of the order coming up for the Pirates. With OCC's hot-hitting lefty, Powell, coming to the plate against the right hander, Poncedeleon, a pitching change seemed eminent, but there was no call down to the bullpen this time around. Powell legged out an infield single to third that loaded the bases for Licon, who hit a sac fly to right that broke the 1-1 tie to give Coast a 2-1 lead. OCC tacked on another run in the top of the eighth inning to go up by two runs. Cypress would answer back with a run in the bottom of the inning to get it back to a one-run affair when Brad Hartong scored his second run of the game after singling through the left side, and advancing to second on a throwing error by Yuhl on a failed pick off attempt to first base. Hartong moved over to third base on a ground out by Torres, then scored easily when Robert Chavarria (2 for 4, 1 RBI) hit a blooper down the right field line that dropped in between OCC's second baseman and right fielder to make it a 3-2 ballgame. OCC would tack on another run in the ninth inning to regain a two-run edge at 4-2. The Pirates made that lead hold up with a scoreless last at bat by the Chargers that gave Coast the season series. The two teams will meet again on Thursday at 2 p.m. in Costa Mesa for the final time in league play this year. On Saturday, Cypress travels to Riverside to take on the Tigers for the second time this season at noon. Torres drives in a pair of runs and tosses a scoreless eighth inning for the Chargers. Fullerton, Calif. - Cypress College never really got anything going against Fullerton College on Thursday, in a 13-3 Orange Empire Conference loss on the road. Jonathan Torres finished the day with two of the Chargers (14-5, 4-3) five hits against the Hornets (5-9-1, 2-5). Torres also drove in a pair of runs, while Jake MacWilliam had the only other RBI for Cypress. Anthony Razo, Robert Chavarria and Jake Clark accounted for the Chargers three runs scored. Cypress' Stephen Derr came into the game in the bottom of the first to relieve starting pitcher Kyle Ferramola who finished the day with one run allowed in two thirds of an inning pitched. In all, nine Cypress pitchers got work out of the pen, including Torres, who saw his first action on the bump this season. 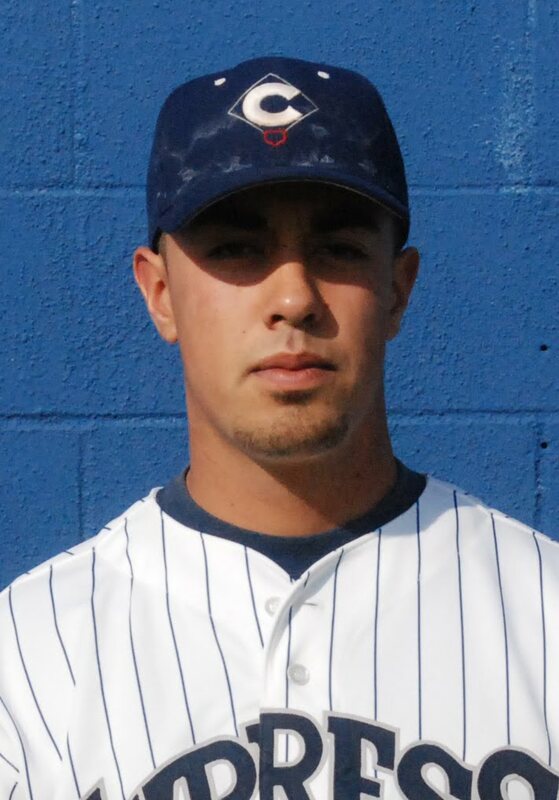 In his only inning on the mound, Torres tossed a scoreless eighth inning for the Chargers. Fullerton went ahead very early on, with a run in the first inning, then two more in the second to go up on the Chargers 3-0. After a scoreless third inning by both parties, the Hornets put the game away in the fourth inning with a six-run outburst that opened up a nine-run lead over Cypress. Fullerton added three more runs to its total in the fifth inning to stretch the lead 12-0. In the top of the sixth inning, Cypress cut into the Hornet's lead with three runs to make it a 12-3 ballgame when Anthony Razo singled to lead the inning off, then moved up to third when the next two batters, Chavarria and Clark reached on errors to load the bases for Torres. Torres got the Chargers on the board with a two RBI single through the right side that brought in Chavarria and Razo. Chavarria would come around to cross the plate for Cypress' final run of the game. Fullerton tacked on one final run in the bottom of the sixth inning to make it a ten-run final, 3-3.. That would be all the scoring either side would get the rest of the way as Fullerton College picked up its second Orange Empire Conference game of the year. Cypress returns home next week to host the league leading Orange Coast College Pirates at 2 p.m. on Tuesday, before going back to Coast on Thursday for the final regular season meeting of the year between those two squads. On Saturday, Cypress will take on Riverside for the second time this season. 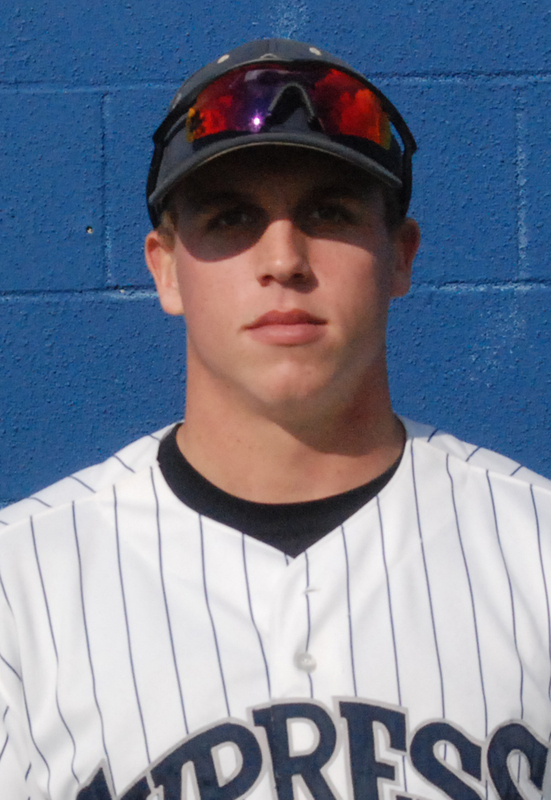 Clark homers for second game in a row in 10-5 win over Rustlers. Huntington Beach, Calif. - Jake Clark drove in two runs and scored three times to lead a 14 hit attack by Cypress College in a 10-5 Orange Empire Conference victory at Golden West on Tuesday. Josh Anderson came out of the bullpen in the second inning to earn the win after tossing 4.1 innings of one run ball. Cypress (13-4, 4-2) starting pitcher Raleigh Rushing gave up two runs in one inning on the hill. Parker Starr chipped in with a team-high three hits against the Rustlers (11-7-1, 3-3). Dylan Fitzgerald and Jonathan Torres both finished with two hits, two RBI and one run scored. Cypress jumped all over GWC in the top of the first with a six-run inning to begin the game. The Rustlers were never able to recover after that. Dylan Moore got the action started with a one-out double. Robert Chavarria followed with an RBI double to drive Moore in, then Clark reached on an error to give Cypress runners in scoring position with only one out. The next man up, Fitzgerald, made it a 3-0 game with a two RBI single that plated Chavarria and Clark. Torres singled in Fitzgerald for the fourth run, then Rowan Wick drove him in with a triple. A single by Starr send Wick in from third to give Cypress a commanding 6-0 edge after a half-an-inning. Golden West would cut the defecit to three runs after scoring once in the second, and two times in the third to make it a 6-3 ballgame.The score wouldn't budge from there until the eighth inning when the Chargers added another run to their lead when Clark scored on sac fly to right by Torres. Cypress would add three more runs in the top of the tenth inning to go up 10-3 after Anthony Razo hit a leadoff triple, then scored on a wild pitch. A few batters later, Clark drove in Chavarria with his second homer in as many games. GWC got two back in the bottom of the ninth, but the Chargers weren't going to let this win slip away. Cypress travels to Fullerton College on Thursday to take on the Hornets at 2 p.m.
Chargers rally to beat Santa Ana in extra innings. 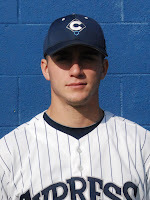 Cypress, Calif. - Mike Marcoux came through with a huge two-out, pinch-hit single that brought the Chargers back from two runs down in bottom of the ninth inning to send the game into extra innings. Robert Chavarria drove in the game winner in the bottom of the tenth to complete the come-from behind Orange Empire Conference victory over Santa Ana College at home on Saturday. A leadoff double by Brad Hartong (2 for 4, 1 Run) would prove to be the eventual game winning run when Chavarria slapped a single through the left side to bring him in. Down a run heading into the top of the ninth, Darren Gidley was brought in to start the inning by head coach Scott Pickler to keep it a one-run ballgame. The Dons Armijo had other plans when his solo shot over the left field wall gave SAC the insurance run it was looking for to make it 6-4 heading into Cypress College's last at bat. After a pair of ground outs to begin their half of the ninth, the Chargers (14-3, 3-2) got a gift from above when Dylan Fitzgerald's routine grounder to second nearly ended the game in what looked to be the final out of the day, but a game-changing error by the Dons' second baseman allowed Fitzgerald to reach first safey, and keep the Chargers comeback hopes alive. When a pinch-hit walk by the next man up, Trent Zaks, chased Santa Ana starting pitcher Bryan Clough after 8.2 innings of work, SAC reliever Christian Uchytil came out of the bullpen to try and shut down the Cypress rally. After working the count full, pinch hitter Zack Alofatuli drew a walk to load the bases full of Chargers for the third pinch hitter of the inning, Marcoux. Marcoux didn't waste any time against Uchytil when he jumped on a first pitch fastball, and delivered a two-out, game-tieing single up the middle that brought Fitzgerald in from third base, and pinch runner Anthony Razo around from second base to tie the game at 6-6 and send the game into extra innings. The Chargers got two big sparks to start the game off with a 2-0 lead after Pierce Bily hit a leadoff bomb over the left field wall to put Cypress on the board first. A couple of batters later, Jake Clark cranked his second home run of the year to make it a 2-0 game. Santa Ana got one run back in the second, but Cypress opened up a 4-1 advantage heading into the fifth inning after Clark and Fitzgerald scored on a couple of fielding errors in the bottom of the fourth inning. The Dons answered right back with a pair of runs in their half of the fifth to cut Cypress' lead to a run at 4-3, then scored twice more in the sixth the take their first lead of the afternoon at 5-4. That would be the end of Cypress starter Daniel Poncedeleon's day after five innings on the hill. Poncedeleon wouldn't factor into the decision. SAC held onto that one-run lead until Armijo's solo homer in the ninth put the Chargers in a two-run hole heading into the bottom of the ninth inning. The comeback kids have been making a habit of winning games late this season, and Saturday's win over the Dons was no exception. The Chargers won their OEC home opener over Riverside College in the bottom of the ninth after trailing by a run to start the inning, and used a four-run seventh inning to re-take the lead over Saddleback College on Thursday to pick up their second conference win. Two days earlier they nearly did it again at Irvine Valley, but a missed scoring opportunity in the top of the ninth left the door open for IVC to turn the trick on them with a walk off single in the bottom of the ninth inning. Cypress goes on the road for a pair of games at Golden West College at 2 p.m. on Tuesday, March 13, and at Fullerton College at 2 p.m. on Thursday, March 15, before returning home to host OEC leader, Orange Coast College at 2 p.m. on Tuesday, March 20 in a matchup between two of the top teams in the state. Cypress College scored four times in the bottom of the seventh inning to beat Saddleback College 7-4 at home on Thursday. Cypress, Calif. - The Chargers rallied back from a run down in the seventh to walk away with a 7-4 Orange Empire Conference victory over Saddleback College at home on Thursday. Cypress (12-4, 2-2) started the game out strong with the first three batters in the lineup coming in to score to make it a 3-0 ballgame heading into the second inning. Pierce Bily (2 for 4, 1 Run) led off the game with an infield single, then came around to score on a triple down the right field line by Dylan Moore (1 for 4, 1 Run, 1 RBI). Moore didn't have to wait long to cross the plate either, as the next batter up, Robert Chavarria (2 for 5, 2 Runs, 1 RBI), drove him in with an RBI double. Chavarrio scored a couple of batters later after stealing third base and scoring on an RBI single by Dylan Fitzgerald (1 for 1, 1 Run, 1 RBI) to give Cypress a 3-0 lead over the Gauchos. The Chargers finished with five stolen bases on the afternoon, including a pair by Bily - who stole second base, then third on the next pitch - Jake Clark (2 for 5, 1 Run), Chavarria and Alex Newman (1 for 3). Saddleback College (5-8, 0-4) would answer back with one run in the second inning to cut Cypress' lead to 3-1, but that's all the scoring either side got for the next couple of frames, as both starters settled in. Cypress College starting pitcher Carl Robinson (0-1) didn't factor into the decision after leaving the game in the top of the sixth up 3-2 with the bases loaded full of Gauchos. Ricky Schafer (3-2) earned his team-leading third win of the year in relief. With one run already in for the Gauchos in the top of the sixth, Cypress lost its lead for the first time in the game when Joseph Martin singled to center and drove in two runs to give Saddleback a 4-3 edge. The score stayed that way until the bottom of the seventh inning when the Chargers scored four times off of Saddleback's bullpen. Gaucho starting pitcher, Evan Manarino wouldn't factor into the decision either, after leaving the game clinging to a 4-3 lead through six and a half innings. Reliever Christian Stubbs (1-3) got the loss for the Gauchos after giving up a leadoff single to Chavarria, then a line drive to center that was dropped to put Clark on base as well. Parker Starr (1 for 4, 1 Run, 2 RBI) came up with a clutch two-run single up the middle that scored Chavarria and Clark to put the Chargers back on top for good. A sac fly by Brad Hartong (1 RBI) brought in Fitgerald for the Chargers third run of the inning. A wild pitch by the Gauchos third hurler of the inning, Kyle Katsandri, allowed Starr to trot in from third base to give Cypress a 7-4 lead. That would finish off all the scoring for the game and guarantee Cypress College its second OEC victory of 2012. Charger closer Darren Gidley came in to close out the ninth, and earn his team-high fifth save of the season. Cypress looks to remain undefeated in OEC play at home this season when they host Santa Ana College on Saturday at noon. Irvine Valley scores one run in the bottom of the ninth to edge Chargers. Irvine, Calif. - Cypress couldn't capitalize on a scoring opportunity in the top of the ninth, while the Lasers made the most of their chance in the bottom half of the inning to pull out a 3-2 Orange Empire Conference victory at home on Tuesday. The Chargers (11-4, 1-2) scored twice in the eighth inning to tie the game at 2-2, then looked like they might take the lead for the first time in the game in the ninth when Brad Hartong singled and stole second base to lead off the inning, before the next man up, Anthony Razo, drew a walk to give Cypress runners on first and second with nobody out. Cypress tried to move Hartong to third on a sac bunt by Dylan Moore, but a quick throw to third by IVC (8-8, 2-1) starting pitcher Jesus Meza got there in time to get Hartong for the first out of the inning. Razo and Moore both moved into scoring position on the next play when Dylan Fitzgerald grounded out to first base for out number two, but they were both left stranded at second and third base when IVC relief pitcher Jason Euler (2-0) got Jake Clark swinging for the final out of the inning. 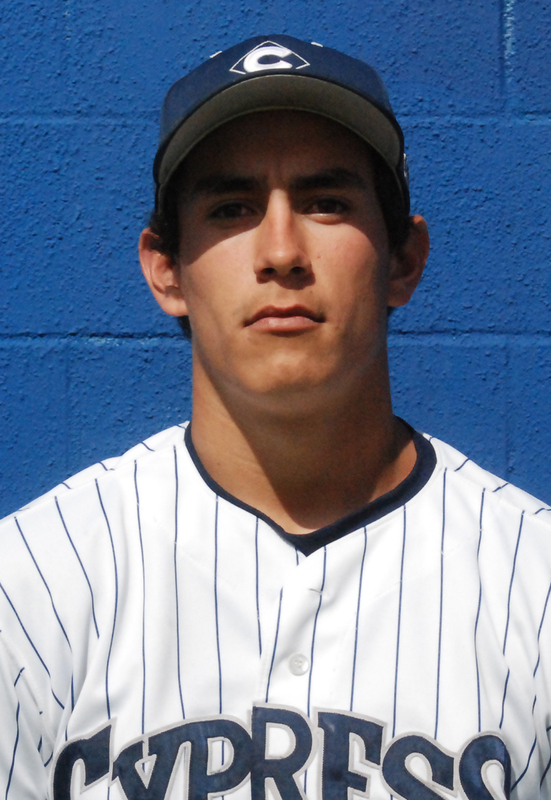 Irvine Valley got a pinch-hit single by Tyler Acevedo to lead off the bottom of the ninth inning against Cypress reliever Ricky Schafer (2-2) - who lost for only the second time this season. The Lasers got another single by Bryce Hara two batters later to move Acevedo into scoring position, then a one-out walk-off single to left by Scott Kaplan gave the Lasers their second OEC win of the year. Three Chargers collected Cypress' six hits in the ballgame. Jonathan Torres, Hartong and Parker Starr each had 2 for 4 days at the plate. Torres and Clark scored the Chargers' pair of runs in the top of the eighth inning. Cypress starting pitcher Raleigh Rushing went 4.1 innings with one run allowed on three hits. Josh Anderson gave up a run in 2.1 innings of relief, before Schafer came in to pitch the eighth and ninth. The Chargers will return home to host two league games to close out the week. On Thursday, Cypress will host Saddleback College at 2 p.m.
Saturday's noon matchup will feature the Chargers against rival Santa Ana College in an early season test for both squads. Brad Hartong delivered a two-out walk-off bunt in the bottom of the ninth. Cypress, Calif. - Cypress College baseball earned its first Orange Empire Conference victory of the year with a walk-off 5-4 victory over Riverside Community College in the bottom of ninth inning at Charger Field today. The Chargers (11-3, 1-1) got the tying run aboard in the ninth when Trent Zaks singled up the middle with one out in the inning. Parker Starr followed with another base knock to move Zaks into scoring position, then Anthony Razo avoided an inning-ending double play when he legged out a fielder's choice that got Starr for the second out of the inning on his way to second base. Cypress sophomore catcher Brad Hartong made the most out of his only at-bat on the afternoon when he caught RCC's third baseman playing back a little too far, and laid down a perfect squeeze that scored Zaks from third base to give Cypress the one run conference victory. Darren Gidley (2-1) won his second game of the year after coming into relieve Charger starting pitcher Daniel Poncedeleon in the top of the eight inning. Poncedeleon finished with nine strikeouts and four runs allowed - three earned - in 7.1 innings of work. Gidley tossed a scoreless 1.2 innings that included striking out three of five hitters. Rowan Wick and Parker Starr both had a pair of hits and an RBI. Cody Webster and Hartong's game winning hit accounted for the Chargers other RBI. Robert Chavarria scored twice for Cypress, Jake Clark, Starr and Zaks rounded out the scoring for Cypress College. Cypress will travel to Irvine Valley College on Tuesday, March, 6 for a 2 p.m. game, before returning home to play Saddleback College at 2 p.m. on Thursday, March 8. Three big innings by Orange Coast prove too much to overcome for Cypress in league opener. Costa Mesa, Calif. - Cypress College (10-3, 0-1) had trouble getting its offense going in a 12-4 loss on the road to Orange Coast College (13-1, 1-0) in both schools Orange Empire Conference opening game. Cypress starter Carl Robinson (2-1) had a rough outing to earn his first loss of the season, after allowing seven runs - all earned - on seven hits with a pair of walks and a strikeout in four innings on the hill. The Pirates took the lead in the bottom of the second with a four-run outburst that broke a scoreless tie. Cypress got one run back in the top of the fourth when Dylan Fitzgerald led off the inning with a double to left field, then moved up to second after the next two batters grounded out. A single to left by Jake Clark advanced Fitz to third base, and a single through the left side by Jake MacWilliam brought him in for the Chargers first run of the afternoon to make it a 4-1 contest. An inning later Coast posted its second four-run inning of the ballgame in the bottom half of the fifth inning to stretch its lead to 8-1. Josh Anderson was the first of four Charger relievers to finish out the game for Cypress. Ricky Schafer, Jake Tillinghast and Stephen Derr were the other three to pitch for Cypress out of the bullpen. 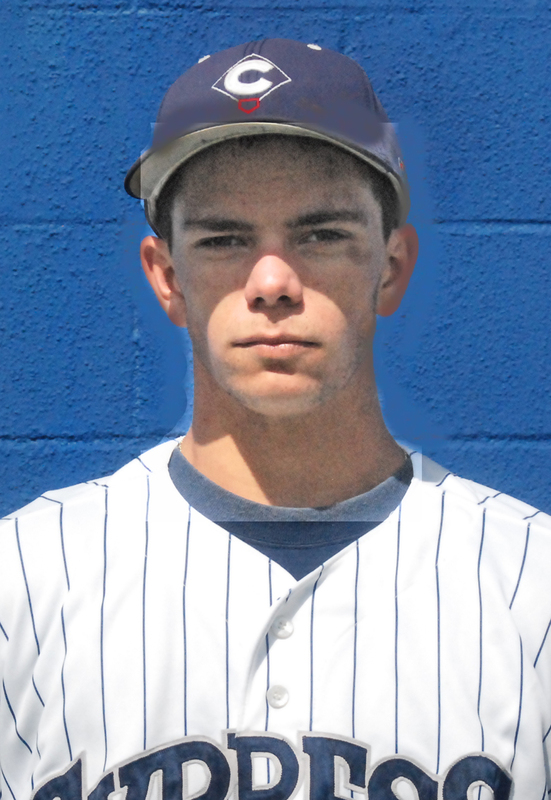 OCC's starting pitcher Brandon Brennen (5-0) gave up another run to the Chargers in the top of the seventh when MacWilliam scored on a wild pitch all the way from second base to make it an 8-2 game. Brennen would get out of the inning, and finish his day with two runs allowed - both earned - on four hits, with four strikeouts, and two walks, in seven innings, to earn his fifth victory of the season. Cypress got a rally going in the top of the eighth inning to cut the deficit in half when Dylan Moore hit a one-out double to left center, moved over to third on a passed ball, and scored on a single to left by Robert Chavarria to give Cypress its third run of the day. Back-to-back singles by Jonathan Torres and Clark brought Chavarria in to score and make it an 8-4 game. In the bottom half of the inning, Orange Coast put the game out of reach with its third four-run inning of the game. That would close out the scoring for the game, and give OCC a 12-4 Orange Empire Conference victory at home in their league opener. The Chargers will host Riverside Community College on Saturday, March 3 at noon in their OEC home opener. The Chargers made it two in row over the Bulldogs with a 9-5 win Thursday, and a 7-4 victory today. Cypress, Calif. - Cypress College hit double digits in the win column for the first time this season after beating the visiting Bulldogs from Allan Hancock College 7-4 in the second game of a split doubleheader that started on Thursday with a 9-5 win by the Chargers. Charger starting pitcher Daniel Poncedeleon (2-0) got some early help from a big four-run bottom of the second inning, to pick up his second victory of the year. Poncedeleon threw a solid 5.2 innings of four-hit ball with five strikeouts and two runs allowed. Four other Cypress hurlers came out of the bullpen to secure the victory for the Chargers (10-2) after the Bulldogs (2-9) battled back to get within two runs at 5-3. Reliever Darren Gidley (1-1) earned his fourth save of the season after throwing a scoreless eighth and one-run ninth inning, which included stranding a pair of Bulldog runners on second and third with no outs in the top of the eighth inning, and homerun allowed in the ninth. Pierce Bily (2 for 4, 2 RBI, 2 Runs) made the most of his return to the leadoff spot on Saturday by scoring the first run of the game on a Jake Clark (1 for 4) double play ground ball in the bottom of the first. The Charger bats got right back after it against Allan Hancock's starting pitcher Cody Shrider (0-2) in the bottom of the second inning when they put four more runs on the board to open up a commanding 5-0 nothing advantage. Shrider would finish the inning, but his day was done after that. His closing line included five runs allowed - all earned - on six hits, three walks, no strikeouts, in two innings of work. Trent Zaks (0 for 3, 1 Run) and Jake MacWilliam (0 for 1, 2 Runs, 2 Walks) both came in to score on a two RBI single by Bily to give Cypress a 3-0 edge in the ballgame. After Bily and Brad Hartong (2 for 2, 1 Run) pulled off a double steal of second and third base, Hartong came in to score on a single by Robert Chavarria, then Bily trotted home on a sac fly to left by Dylan Fitzgerald (2 for 4, 1 Run, 1 RBI) that put the Chargers comfortably ahead 5-0. After scoring a pair of runs in the top of the fifth inning to cut the deficit to three, Allan Hancock added another run in the top of the seventh to make it a two-run ballgame. Cypress answered back with a run in the bottom of the seventh, and another run in the eighth to stretch its lead back to four runs. Fitzgerald scored on a hard hit liner to first by Zach Alofaituli (0 for 3, 1 RBI) that the Bulldog first baseman couldn't handle. A perfectly placed drag-sac bunt by Anthony Razo in the bottom of the eighth scored MacWilliam from third base for the Chargers final run of the inning. Hancock's Daniel Mallory (2 for 5, 3 RBI, 2 Runs, HR) hit his second home run of the series when he connected off of Gidley for a homerun over the centerfield wall in the top of the ninth inning. That finished off all the scoring for the game to give Cypress a 7-4 non-conference win, and a series sweep over the Bulldogs. Cypress scored nine runs on 14 hits in a series opening victory over Allan Hancock College on Thursday. Jake Clark hit his first home run of the season, and finished 2 for 3 at the dish with three runs scored and a pair of RBI. Fellow sophomore Brad Hartong (1 for 1, 2 Runs, 1 RBI) joined the homerun club as well when he deposited his first round tripper of the year over the wall in left field. Razo (3 for 4, 1 Run) continued to swing a hot bat for the Chargers, while three other Cypress hitters chipped in with multiple hit efforts. Mike Marcoux finished the day 2 for 4 with an RBI, Dylan Moore went 2 for 4 with a run scored and an RBI, while Jonathan Torres had a pair of hits in four at-bats, and came in to score both times. MacWilliam scored the other Charger run in the game, while Rowan Wick accounted for Cypress' only other other RBI. On the mound, Ricky Schafer went to 2-1 on the year after picking up the victory coming out of the bullpen. Cypress starting pitcher Carl Robinson got the no-decision after coming out after four innings. Robinson was having a great strikeout day on the mound by fanning 7 of the 15 hitters he faced, and only giving up three hits and two runs. Alon Leichman made his third appearance of the year after battling back from Tommy John Surgery, which kept him on the shelf for all of last season. Schafer's 2.2 innings of shutout ball kept the Bulldogs at bay and put Cypress in great position to win. Raleigh Rushing got his first save after tossing a scoreless ninth inning. Cypress will open its Orange Empire Conference schedule next week with an away game against the undefeated Pirates from Orange Coast at 2 p.m. on Thursday, March 1, before returning home to host Riverside C.C. on Saturday at noon. The Chargers scored twice with two outs in their last at bat. Cypress, Calif. - Cypress College pulled off an amazing 9-8 come-from-behind win over El Camino College in the bottom of the tenth inning at home on Tuesday, when Anthony Razo came through in the clutch with a walk-off single that scored Pierce Bily for the game winner. The Chargers had their backs against the wall in the bottom of the tenth inning after a fielding miscue allowed El Camino to score the go-ahead run on a dropped routine fly ball that should have been out number three. Warrior reliever, Michael Heredia came in to close the game for El Camino, and went right to work by putting the first two Cypress hitters down in order. El Camino looked to be in good position to hold on for an 8-7 road victory with Heredia dealing on the mound, but Cypress skipper Scott Pickler had other plans. When freshman Zach Alofaituli heard his number called to pinch hit with two down, and nobody on base, he made the most of his opportunity to help the team by delivering a double down the left field line that kept Cypress alive. The next man up, Pierce Bily, drove in Alofaituli to tie the game at 8-8 with a hard hit ball to El Camino third baseman, Cole Trezek. Trezek tried to range to his left, but only managed to get close enough to have it bounce off the heel of his glove and roll onto the outfield grass. Alofaituli was running hard on the play, and scored easily from second to get the game back to even. Bily moved into scoring position after stealing second, then Razo delivered one of the biggest hits of his Charger career when his walk-off single to center brought home Bily to lift Cypress to the 9-8 non-conference victory over the Warriors. Charger reliever Darren Gidley came into the game to pick up a save, but ended up earning his first win of the year after Cypress scored twice in their last at bat to win. Gidley had allowed a run in the ninth that tied the game, and an unearned run in the tenth that gave the Warriors the lead. El Camino took an early three-run lead in the top of the first inning when Cypress starting pitcher Kyle Ferramola walked the first three batters of the game. One batter later, Pickler made the call to the bullpen for Josh Anderson. Anderson kept the Chargers in position to get back into the game by tossing a solid 3.2 innings of relief, with only one run allowed on three hits and three strikeouts. Reliever Daniel Poncedeleon was in line for the win after holding the Warriors scoreless in the top of the seventh, before Cypress rallied from three-runs down in the bottom of the inning to take 7-6 lead. Razo, Jake Clark and Jonthan Torres each finished with two hits on the day. Clark and Torres tied for the team-lead with two RBI's apiece. Parker Starr, Robert Chavarria, Bily and Razo's game winner accounted for the other Cypress RBI's in the game. Dylan Moore scored two runs, while Mike Marcoux, Bily, Razo, Clark, Torres and Starr all crossed the plate one time each. Chavarria and Torres both had big RBI doubles in the game. The Chargers scored a run in each of the first three innings of the ballgame to battle back to even with the Warriors after spotting them three-runs in the first. El Camino regained the lead in their next at bat with one run in the top of the fourth inning. The Warriors opened up their second three-run lead of the game in the fifth inning with two more scores that made it a 6-3 contest. The Cypress bats were silent for the middle three innings, but a pair of singles by Razo and Moore to lead off the bottom of the seventh for the Chargers was just the spark Pickler was looking for. Clark singled in Razo for the first run of the inning, then Torres blasted a two-RBI double down the right field line that tied the game at 6-6. A ground out to third by Starr brought in the Torres to give Cypress its first lead of the game. El Camino answered back with a run in the ninth to tie, and another in tenth inning to take a one run lead, but Cypress would have the final say in this matchup between two very good teams. Cypress will host Allan Hancock College for a two-game set beginning this Thursday at 2 p.m. The second game of the series will begin at noon on Saturday. Those two games will be the final non-conference games on Cypress' 2012 schedule before opening the Orange Empire Conference regular season with a road game at Orange Coast next Thursday, March 1 at 2 p.m.